Marc Hagan-Guirey a.k.a Paper Dandy, creates spooky scenes using nothing but paper and scissors. 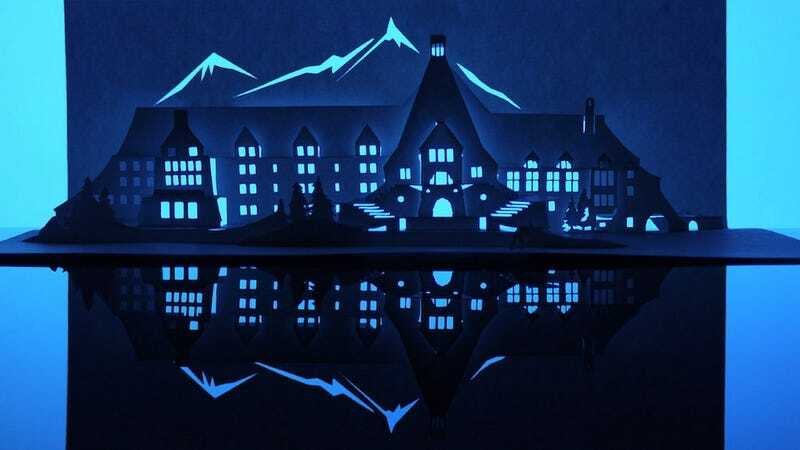 Employing the paper cutting art of kirigami, his "Horrorgami" sculptures recreate haunted houses from classic horror films, and are then blacklit with a spooky glow. Quite early on, I knew the best way to display the buildings was to use light boxes. The models themselves have a dual personality. In daylight they are at their most innocent: you can see exactly how the piece has been engineered and crafted, but at night when backlit, the model takes on a new character. Theatrical silhouettes bring the kirigami to life and the imagination takes over, filling in the blanks and embellishing the model with details remembered from the film. I liken this to the effect of watching a horror movie during the day as opposed the much more fearful experience of watching it a night. Horror films of the ‘70s and ‘80s are in a completely different class to those of today. At the mere mention of films such as The Shining and The Exorcist I'm always blown away by the reaction I get from people and their personal experiences of watching them. They almost have a "Where were you when" feel to them. This is why I think people have such strong reactions to Horrorgami and for me why they're such a joy to make. Here you can see The Shining's Overlook Hotel and The Exorcist's Blair home, and The Amityville Horror and The Addams Family mansion are also up at his site. Other haunted homes, such as the Bates Motel, Ghostbusters headquarters, and The House on Haunted Hill, will eventually join them.